CDependencyGraphNode describes a node in the dependency graph. Definition at line 28 of file CDependencyGraph.h. Definition at line 29 of file CDependencyGraph.cpp. Definition at line 33 of file CDependencyGraph.cpp. Add a dependent to the given node, represented by its node number. This then represents an edge in the graph. const size_t $ node_num The dependency, the node to which the edge connects. Definition at line 36 of file CDependencyGraph.cpp. Return a vector of the dependents. 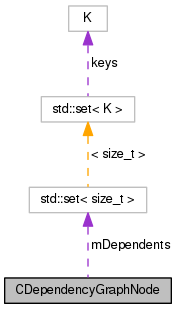 const std::set <size_t> & A vector of the dependents. Definition at line 46 of file CDependencyGraph.cpp. A vector containing the edges for this node. An edge is specified by the remote node to which it connects. Definition at line 67 of file CDependencyGraph.h. Referenced by addDependent(), getDependents(), and operator<<().